My kitchen had a brief stint with a wasp nest this past weekend. Our landlord came over to do a quick patch up job on the ceiling in the far right corner of the kitchen. Water has been leaking into the kitchen every so often over the last ... year or so? It's only happened a few times but the water and falling paint has ruined some chocolate that we were storing in that back corner. The five minute patch up job evolved into a 6 hour project that, at one point, revealed that wasps were leading a cozy life just under the roof. In the cartoon version of this scenario, our Landlord (wearing overalls and a big grin) knocks on a tiny door in the ceiling that opens up to a wasp in a wife beater with a Jersey accent and a comb-over. Behind him, his 25 wife wasps with baby wasps chilling on a tiny wasp couch watch re-runs of wasp Soap Operas ignore the large human with a curious face. Our landlord serves the wasp in a wife beater (lets call him Bob) a teeny-tiny notice of eviction. Bob looks dolefully down, furrows his tiny insect brow and shrugs his shoulders. He walks over to his wife wasps holding their wasp babies and tells them the news. "Thank the Wasp Gods! This place is practically a slum!" They buzz back. Apparently they'd outgrown their digs and were looking for a move anyway. They pack up their bags (tiny wasp sting-brushes, wing sweaters, flight goggles) and get really drunk before they bumble through the kitchen and outside to greener trees or bigger roofs. The real story is that our Landlord sucked them all up with a vacuum. So, in lieu of hanging out while wasps were being sucked up and drywall was flying, we went out to eat at Mas for the first time. Mas is a Spanish tapas place. THE Spanish tapas place in Central VA. It's expensive, always packed, and the service is slow by American standards (fast by Spanish standards). Who cares. It's easy to forget your kitchen is filled with drywall dust and poisonous bugs when your mouth is full of Sangria, smoked tomatoes in olive oil, and goat cheese artichoke spread. Crispy, salty patatas bravas with a homemade, yolk-heavy aioli and a thick Spanish egg and potato tortilla rounded out the meal. Mas is not a vegetarian restaurant by any means. But they take the extra step to source ultra-local veggies, meats, and spices and use the best quality olive oil and salt I've ever had at a restaurant. I was giddy that they had a handful of tapas and raciones that were either naturally veg and gluten free or could be eaten without the (completely delicious looking) house made wheat bread. We liked Mas so much that Logan and I have decided that instead of spending money a couple of times a month on eating out at so-so spots, we're saving up our money to go to Mas every month or two. It's worth it. And eggplant! Is eggplant under appreciated? I feel like it is, mostly. I mean, how do most people eat it? Eggplant parmesan, right? Babaganoush if they live near some Lebanese folks with a restaurant. And yet eggplant is SO easy to prepare at home. And all it needs is a rub of olive oil, salt, and garlic and a splash of a good sauce to make it a meal (at least in my house). My recipe for Roasted Eggplant with Turmeric Yogurt Sauce was originally on the Relay Foods Blog (check out the post here). Thanks to Relay Foods for sponsoring this post! Halve your eggplants lengthwise, keeping the green tops on, and place face up on a baking sheet. Rub the cut side of your eggplant with olive oil, salt, and ground pepper. Roast 35 to 40 minutes, until browning (if your eggplant is starting to look dry, add 1/4 cup water to the pan around 30 minutes). 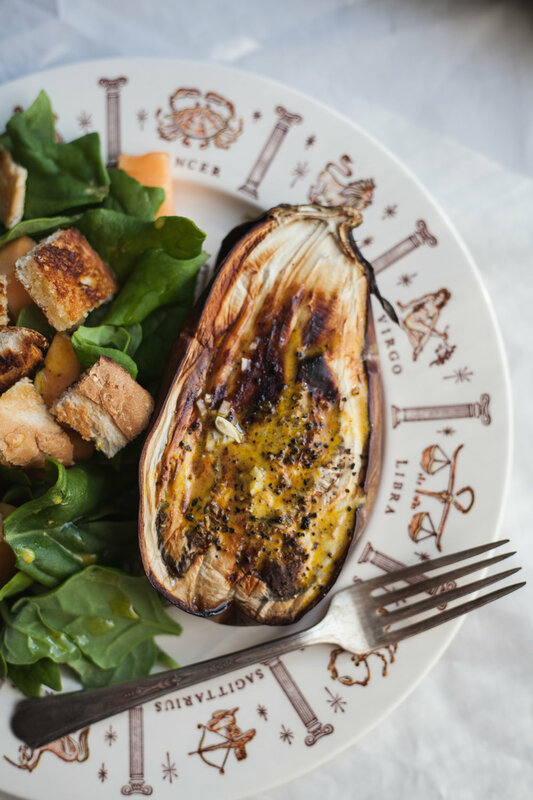 While the eggplant is roasting, combine lemon juice, garlic, and olive oil in a small bowl. Set aside. In another, separate bowl combine diluted yogurt, lemon juice, honey, turmeric, salt, and pepper. Stir to mix everything evenly. Set aside. When the eggplant is done roasting, remove it from the oven and immediately brush the lemon-garlic-olive oil mixture over the cut side. Let cool 10 minutes. When you're ready to serve, drizzle the turmeric yogurt sauce over the eggplant liberally.